Round 2 of our Winter Bouldering League will take place this Friday night. This means that the Berghaus Competition Wall will be stripped this Thursday so if you have any projects on there, time to get them sent. 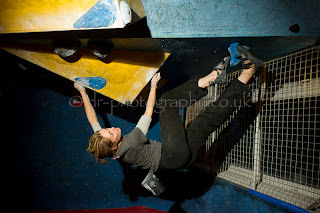 As usual, there will be 2 cash prize problems of £125 for both Male & Female, 2 pairs of FiveTen shoes for everyone who hands in their scorecard, and a lot of high quality problems. You can read about the competition on the website here and view a whole load of pictures from Round 1(courtesy of Dom Worrall) on our facebook page.